I would have never thought this would happen. This pistol is always either in the gun box or safe. It is the first issue that I have had with composites in guns (and my experience includes more than 25,000 rounds of .45 through a Glock 21). 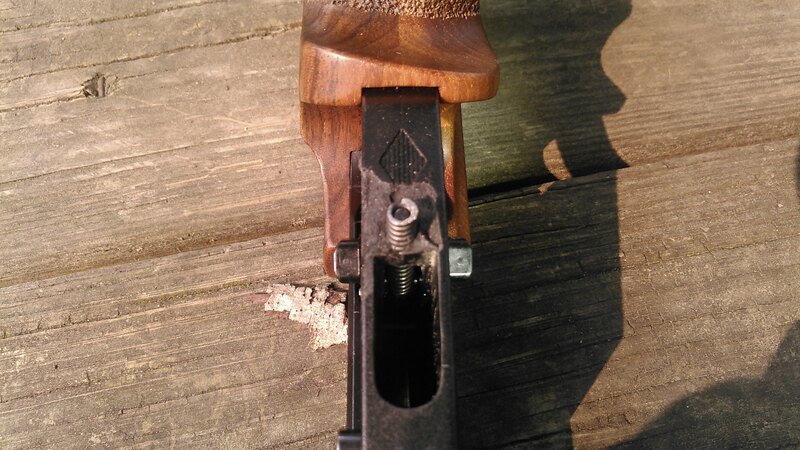 Has anyone upgraded their MP95 to the MP90 trigger mechanism. Is it's housing metal or plastic? So how did this happen? Did you just find it that way? If the damage just spontaneously occurred, I'd suggest sending the trigger unit to Larry's. Especially if you bought the gun from him, he might replace the unit. Or you could ask for credit towards the MP90 unit, which does have a metal housing. I shot match Saturday. It was fine then. I put it in the gun box. I opened the box Tuesday night to clean before going to shoot some practice and discovered what you see in the photo. The gun was stable in the box. I bought the gun used at a very good price, and have every reason to believe that it is at least 18 years old. It is marked EAA. While the issue may be a materials or manufacturing problem, it is in no way Larry's fault. If the mp90 housing is metal I will buy it. Heck, this gives me a good opportunity to take the dot off and give the pistol a thorough cleaning. I shot a match tonight but used my iron sighted pardini. I don't have another match for a week. For anyone wondering, the MP90 trigger group housing is metal rather than "technopolymer." I have one on order, now I will have to learn the adjustment procedures. Not really Rich. That spring is the hammer reset spring. It is very strong. The reset pin sticks around 1/8 inch out of the bottom of the technopolymer housing. The spring is on the inside. I can compress that spring less than an 1/8 of an inch, it is strong. For 18 years it was pressing against the bottom of the technopolymer housing. Generally technopolymer gives before spring steel. The failure is the exact point that I would expect the housing to fail because it is the point of the most direct pressure. Okay for compression, but any strong tension applications like that without the plastics equivalent of METAL rebar is IMexperiencedandinformedO asking for a fail! GrumpyOldMan wrote: It's Plastic. PLAAAASTIC!!! MP90 trigger group has arrived and been installed. With no adjustment it is already better than the mp95. The ability to adjust the trigger blade left, right, forward and backward is nice as well. But the best thing is that 7075 AL is a better material for the purpose than "techno-polymer." I will re-zero the dot tonight. How much $$$ was the trigger group ? How long did you wait for delivery ? Shipped Thursday (the day I ordered). It arrived at the PO for delivery Monday. I picked it up this morning. Cost was a different matter. I think the total was just over $400. That is around $130 more than a replacement MP95 trigger group. Is the trigger housing a die cast product or is it CNC machined from a billet / soild piece of aluminum ? How many adjustments are there ,and is there a sear engagement adjustment ? Can you adjust the trigger with the unit in the reciever ? Any chance you can post a few pictures ? The price is in line with all the other detachable Euro trigger groups out there. The Walther GSP is $405 . If it is not raining, I will try to get some photos tomorrow. But I really like the new trigger group. I shoot it better.